In the mean time Ghost is working on their new Koenig editor, causing a steady stream of small changes to the default Casper theme. To be able to quickly integrate updates without too much fuss I'm maintaining a forked version of the Casper theme containing all my changes. How do I integrate the changes from the main Casper repo without overwriting my own changes. How do I deploy my changes from GitHub to my blog without hassle. git merge master -m "Updating to Casper-2.3.3"
And then resolving the conflicts, testing on a local Ghost Development instance and pushing back to GitHub. Install the Ghost extension from the marketplace. Setup a CI pipeline to push the changes from GitHub to Ghost. The Ghost extension for VSTS is still a bit rough around the edges, but the developer is quickly responding to feedback, removing my initial issues with the task. It's now very fast and does what it needs to do. Next step is to create a new Build Definition in Visual Studio Team service and to link it to your GitHub account. Make sure you select the customized branch, as this is going to be the version of the theme we want to publish. Create a Build Definition and link it to the GitHub repository. 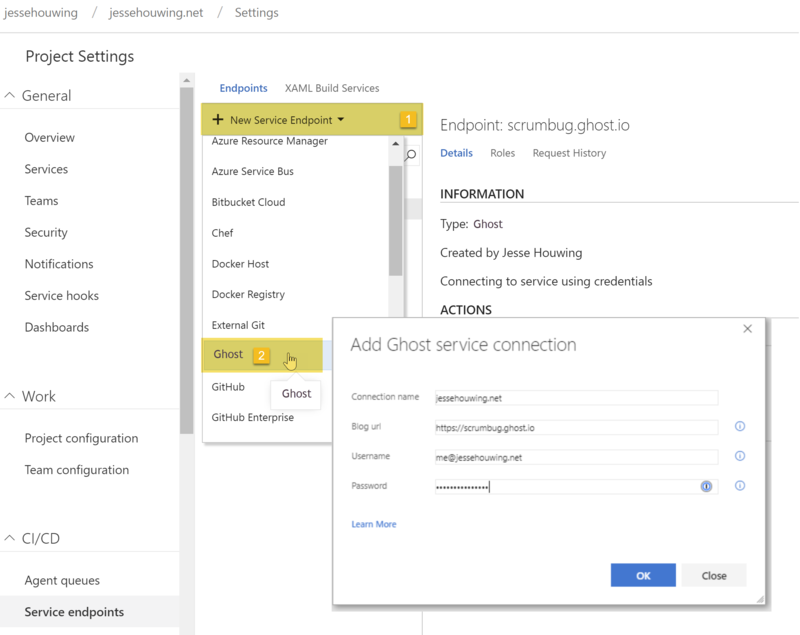 The final required step is to let the Ghost Task publish the theme to your Ghost instance. I found out that the name of the theme is important, as Ghost may decide to create a new theme or overwrite the existing one depending on the name. Add a Ghost connection to your project. While debugging you may want to use the Take Screenshots option to see what the Ghost extension is up to. It relies on controlling a browser instance to upload the theme. The Hosted Agent has Chrome installed and the Ghost task should detect it automatically, meaning you won't have to download Chromium. If you agent doesn't have Chrome installed and installing is not an option, you can use the Chromium task to grab Chromium on the fly. Use the Hosted VS2017 agents to satisfy the requirement for interactive agents. If Chromium isn't detected automatically, add the chromium.bin variable and point it to chrome.exe. That's all! Queue your build, if needed analyze the logs and the screenshots, but if all was well your theme should now be versioned in GitHub and auto-deploy through Visual Studio Team Services! The Ghost task in action. Are you using Ghost to blog? Is your customized Theme easy to upgrade whenever Ghost releases a new version? If not, there really is no excuse :).